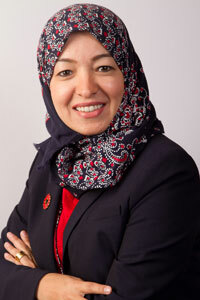 Dr. Hatoon Ezzat received her medical degree in 1995, and pursued specialist training in internal medicine and hematology. She obtained certification in internal medicine and hematology from the American Board of Internal Medicine (ABIM) and is a fellow of the Royal College of Physicians and Surgeons of Canada. She plays an active role in clinical research, and her major medical interests are hemoglobinopathies, including thalassemia and sickle-cell anemia.